TDmonthly - What Is an Eco-Friendly Baby Toy? What Is an Eco-Friendly Baby Toy? 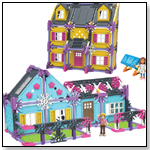 “Green” has been a hot trend in the toy market ever since the lead-paint scares in 2007. 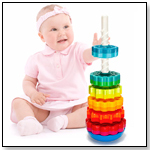 Parents are especially concerned about infant and toddler toys, since they so often find their ways into kids’ mouths. 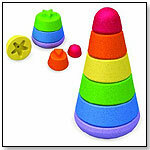 Most manufacturers claim to have eco-friendly baby toys. But TDmonthly Magazine wanted to know —what does that really mean for kids and the environment? "We’ve always used natural wood products and non-toxic paint, and as much natural raw material as possible," Robin Lehnert of Hape International told TDmonthly. "One of the strengths that HaPe has is our expertise in working with bamboo, which is highly sustainable," she added. The German-based company HABA has long been known for its wooden infant and toddler toys, decorated with nontoxic, lead-free paints. It’s now gone a step further in sustainable production: At Habermaas' new facility in Germany, “Geo-Thermal energy is built into the building so all of our heating and cooling is done naturally deep underground,” said Lea Culliton, president of HABA USA. Newer companies are also ensuring that their baby and infant toys are not only safe, but sustainable. "We use a proprietary material we call Sprigwood, which is made from reclaimed wood and recycled plastic, all of which is sourced in the USA," Justin Discoe, vp of sales at Sprig Toys, told TDmonthly. Using FSC certified wood, water-based paint, soy-based inks for packaging and recycled materials for shipping were cited by many of the companies we spoke with as ways to be green. Less obvious green practices included "Calculat[ing] our carbon footprint from corporate activities, manufacturing, and transportation of our products,” then giving back to green energy sources to offset it, Ramirez-Gurria told us. Sprig Toys shared one of their energy saving techniques: "because we offset the amount of recycled plastic we use with reclaimed wood, we are able to injection-mold at lower temperatures,” saving 20% more energy than traditional practices. But really, what is the most important thing to consider when creating eco-friendly toys for infants and toddlers? “Play-value,” Driscoe concluded. See the newest green products from these companies below. What is the favorite food of the cat, dog, and sheep? Little explorers will soon find this out as only the right food will fit through the corresponding holes of the sorting box. 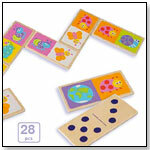 The big wooden pieces stimulate the curiosity of little ones, fosters their senses and train motor skills. Material: Naturally colored birch wood, 6 colored pieces of beech wood and 2 birch plywood templates printed on both sides. Launch date: 2011. A tree will be planted for every collectible, plush Treefie that is registered online. Because children are so interested in doing their part, this line is geared toward educating them about our world, giving them the opportunity to plant a tree, and keeping them interested in the environment. Treefies combine the classic offline play and collecting possibilities of a plush toy with the modern twist of access to the internet. 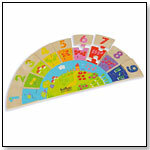 The line includes the following animals: monkey, elephant, eagle, frog, brown bear, lion, panda, shark, leopard, and ferret. This Italian-designed motorcycle is made of bamboo, with just a bit of rubber and metal for the wheels. The body is lightweight and durable, making the E-Moto easy and safe for young children to maneuver. 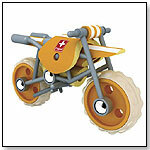 These toys are made primarily of bamboo, an eco-friendly source material that is quick-growing, natural, and renewable. 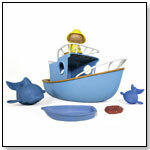 Cone Stacker by SPRIG TOYS, INC.
Captain Owen's Dolphin Explorer Boat by SPRIG TOYS, INC.